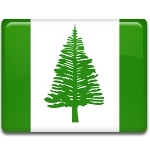 On March 6, the citizens of Norfolk Island celebrate a public holiday known as Foundation Day. On this day in 1788, the first settlers arrived on the island. Norfolk Island is a small island in the Pacific Ocean located between Australia, New Zealand, and New Caledonia. It is a self-governing territory within the Commonwealth of Australia. The first European to set foot on the island was Captain James Cook in 1774. He named the island after Mary Howard, Duchess of Norfolk, because she had asked Cook to have an island named after her. Captain Arthur Phillip, the Governor of New South Wales, decided to colonize the island for defense and foraging purposes. On March 6, 1788, Lieutenant Philip Gidley King brought 7 free men and 15 convicts to the island. At the time, it was primarily used as a penal settlement. From 1825 to 1855, it was one of the most brutal penal colonies. When the penal colony ceased to exist, Norfolk Island was settled by a group of people from the Pitcairn Islands. In 1901, it became part of the Commonwealth of Australia. In 1979, it was granted limited self-government. Although none of the islanders are descendants of the first settlers who arrived in 1788, they still celebrate the anniversary of the first settlement as Foundation Day.